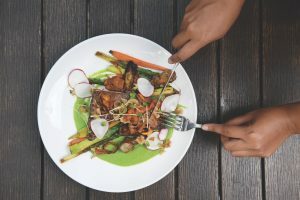 Downtown Santa Ana’s newest full-service bistro lures fans with a bit of practical magic—it turns “no” into reasons to return. As in, no Instagram vibe. No high prices. No frills. No drama. Arguably, it also has no parking, a challenge Fleenor’s on 4th shares with most of its nearby competition. But pesky Santa Ana meter readers shouldn’t keep locals away from what is that neighborhood gem—a welcoming, unfussy, and versatile joint everyone wants more of in their ZIP code. Those hangouts always seem in short supply, so new arrivals are cause for cheer. Serving lunch, dinner, weekend brunch, and a midweek happy hour thick with deals, this friendly place is geared to satisfy. Need to obey your diet with a not-boring vegan salad? Try the cold mung bean noodles with bean sprouts, fresh mint, peanuts, tofu, and edamame glistening in soy-based nuoc cham vinaigrette. Looking to snack on something crunchy and freshly fried? The shrimp fritter with shredded sweet potato delivers sweet-salty joy when dunked in ponzu. Craving meat and potatoes? The Shroom Burger is a genius build of porcini powder-rubbed wagyu, Muenster cheese, and demi-glace clamped with a challah bun accompanied by Kennebec fries. Seafood with a cocktail at the bar? Don’t miss the spicy aioli-slicked ahi tuna poke on crispy rice. It goes down in style with a terrific Old-Fashioned, but there’s always that $5 draft beer if spirits don’t tempt you after office hours. Straightforward but varied, the menu targets foodies and feeders. Worthy dinner entrees include a snazzy Berkshire pork chop rubbed with Indian spices, then grilled to top juicy form. Linh adds roasted fennel, pickled mustard seeds, and kabocha squash emulsion for refined results. The petite New York steak, bone-in and dry-aged, might sound scary cheap at $26, but the expertly grilled beef under a classic au poivre sauce is a delight. Skip the bland bucatini and consider the tasty margherita pizza. You’ll not find a better pizza crust in this ’hood. If a mega main course doesn’t appeal, excellent small plates hide in plain sight as bar bites, starters, and sides. Tempura cauliflower is a breakout star for good reason. 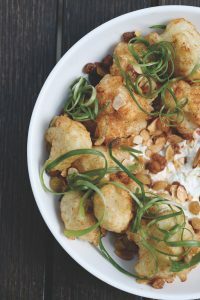 Linh gussies up the ivory florets with dainty tempura crunch, gutsy harissa, cooling cucumber yogurt, plump sultanas, and a sprinkling of almonds. Crispy fried chicken bites are a can’t-lose play; boneless poultry is dry-rubbed before sizzling and calmed with old-school buttermilk ranch for dipping. The menu reads Nashville Spicy Fried Chicken Bites, but they aren’t conspicuously hot. 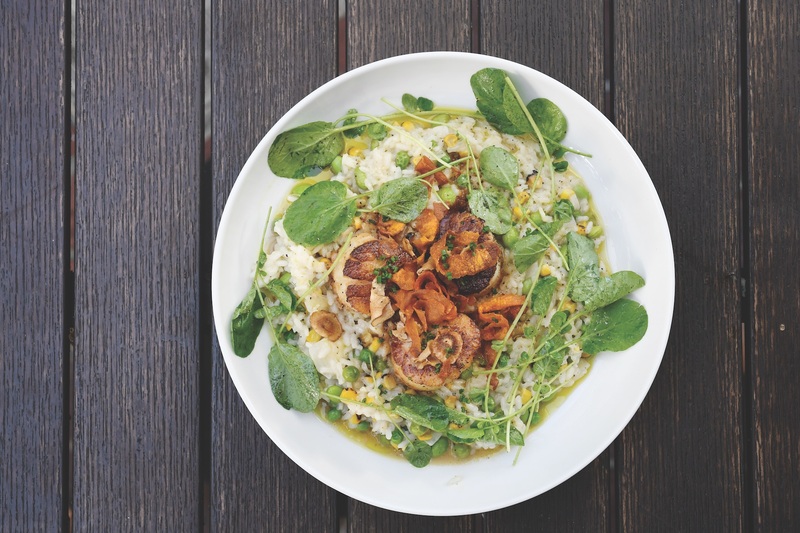 Risotto studded with meaty beech and portobello mushrooms should satisfy vegetarians. Add extra dimension by asking the kitchen if it can spare a drizzle of that green onion oil used on the scallops. Double-cooked, hand-cut Kennebec fries are a naughty pleasure so long as they are crisp, not limp, so stress the crisp factor when ordering. Weekend brunch, with its many appealing dishes, fills the umbrella-shaded patio with families, daytime drinkers, and diners who chill with their canine comrades. Bypass the ho-hum bloody mary and enjoy the refreshing Donna’s Prague Party with whispers of lemon, thyme, and Becherovka, the Czech Republic’s iconic bittersweet liqueur. Bottomless mimosas are a flawed choice when the craft cocktails are so swell. Crème brûlée French toast is lovely under a tumble of fresh berries; it’s ideal for those who prefer dessert for breakfast. Upgrade the respectable, two-eggs chilaquiles with chorizo or carne asada for best results or fall in with the toast brigade and order the caprese interpretation that layers avocado mash, tomatoes, burrata, pesto, and due uova. One more aspect that builds a loyal fan base: hospitality. This crew is low-key but in sync. Over the course of four visits, friendly servers were never less than obliging, and even the bar squad is more engaging than required. It feels like a grump-free zone. If I lived in Floral Park, Artists Village, or even in Orange or Tustin, Fleenor’s couldn’t keep me away.